February 28, 2019  NPR's David Greene talks to USA Today NBA reporter Jeff Zillgitt about the NBA's proposal to update draft eligibility rules and what it would mean for aspiring basketball players. February 27, 2019  NPR's Mary Louise Kelly speaks with The Ringer's Claire McNear about the ongoing indecision from baseball superstar Bryce Harper over which MLB team he will join. 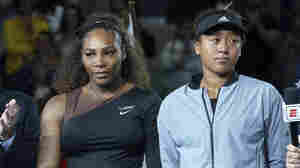 February 25, 2019  The cartoon, published last September in Australia's Herald Sun, sparked a fierce backlash, with critics calling it a sexist and racist caricature of the tennis star. 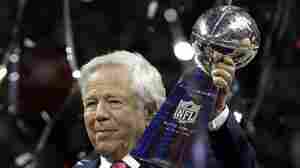 February 25, 2019  The state attorney's office says the New England Patriots owner has been charged with two counts of soliciting prostitution. The sting has also ensnared magnates John Havens and John Childs. February 23, 2019  NPR's Scott Simon talks to ESPN's Howard Bryant about the week in sports, including criminal charges facing Patriots owner Robert Kraft and Zion Williamson's injury on the basketball court. February 23, 2019  NPR's Scott Simon talks to Jack Davidson, a student at Wabash College. He broke the NCAA record for all-time consecutive free throws. He made 95 consecutive free throws, breaking a 22-year-old record. February 22, 2019  The charges are part of a sting on a local spa. 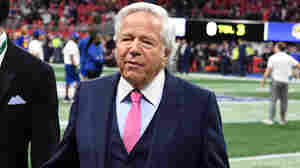 Kraft is being charged with two counts of soliciting prostitution, a misdemeanor, tied to two different visits to the spa. February 20, 2019  Don Newcombe, who joined the Brooklyn Dodgers as a pitcher in the 1940s died on Tuesday. He was 92. Newcombe was one of the first black pitchers in Major League Baseball. February 20, 2019  David Greene talks to Jemele Hill of The Atlantic about the NFL's settlement with Colin Kaepernick, who claimed team owners conspired to blacklist him for taking a knee during the national anthem. February 19, 2019  USA Gymnastics has hired a new CEO: the embattled organization's fourth leader in the past two years. The organization is trying to get beyond a widening sexual abuse scandal. February 19, 2019  Alex Chu is a freshman at Wheaton College, where he was recruited to play goalie. But because his head won't fit into a regular helmet, he's been benched. A custom helmet costs thousands of dollars.